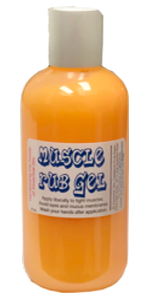 Whether it’s age related soreness or post gym work-out stress, this muscle rub will have old and young feeling great in no time! It’s icy-hot penetrating gel will soothe sore, tired, stiff and painful muscles with its original formulation of 20 essential oils and capsicum fruit resin. Contains Organic Aloe Leaf Juice, Meadowfoam Seed Oil, Menthol Crystals, Capsicum Fruit Oleoresin, White Camphor Bark Oil, Sweet Basil Leaf Oil, Black Pepper Oil, Roman Chamomile Flower Oil, German Chamomile Flower Oil, Cinnamon Leaf Oil, Citronella Oil, Eucalyptus Leaf Oil, Helichrysum Flower Oil, Ginger Root Oil, Pink Grapefruit Peel Oil, Juniper Berry Oil, Lemongrass Oil, Peppermint Oil, Pine Needle Oil, Ravensara Oil, Rosemary Leaf Oil, Spearmint Oil, Wild Oregano Oil, Glycerin, Witch Hazel Water, Organic Alcohol, Phenoxyethanol, Carbomer, Triethanolamine, Tetrasodium Glutamate Diacetate. Directions for use: Apply liberally to tight muscles. Avoid eyes and mucus membranes. Wash your hands after application. Relax and let it work its magic! 3.4 fl oz pump bottle.